Co-Optimus - News - Play Soccer as a Monster Truck in Rocket League; Out TODAY! Okay, so you've just finished watching the Women's World Cup finale explode in goals, and now you think soccer/football can't get any crazier. Normally you'd be right, and after all, the Shrimpers are currently enjoying the off season. Not to worry! The folks down at Psyonix have somehow out-crazied us with Rocket League, a game about flying cars playing future-football and occasionally exploding into burning husks. Finally, your dream of nailing that sweet corner as a minivan and then bursting into flames can be realized! Best of all, it's out tomorrow for both PlayStation 4 and Steam for $19.99. Unless you're a PS+ Member, of course. Then it's totally, totally free. Day one. Free. If my mind weren't further blown by this concept and/or pricepoint, here's a trailer packed full of dubstep to eliminate any remaining brain cells I might have. At long last, we can blend the passion of the Beautiful Game with the magic of Monster Truck rallies. Just imagine the goal celebrations: a sedan nails the perfect flip-kick for the game winning goal. His teammate, a hellblazing semi barreling towards him for an all-too excited embrace. 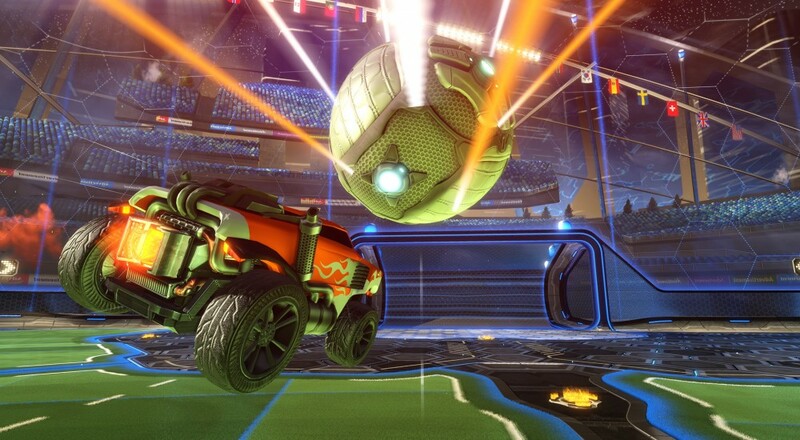 Rocket League is a four-on-four soccer game with cars. You and up to three buddies can play any metric of split-screen or online against an equal number of AI opponents, which is pretty exciting! I expect the high-fives during a tense four-player match to be nothing less than epic. I guarantee I'll be checking this out on PS+ when the game drops tomorrow.